I think it is a bad habit more than anything or maybe I am delusional and am just showing the early signs of "losing it." The husband mumbles...I hear him and it's when I have said something he doesn't want to do - he grumbles that he has to do it. I've caught him a few times, referring to me as a "nag." He forgets that I hear very well. I'm smart. If he tells me something, that I don't want to hear, I usually just say, "Okay, dear." And that's all it takes, to make him happy. I don't like to argue. I mumble when I drive. I grumble when I hear the news. 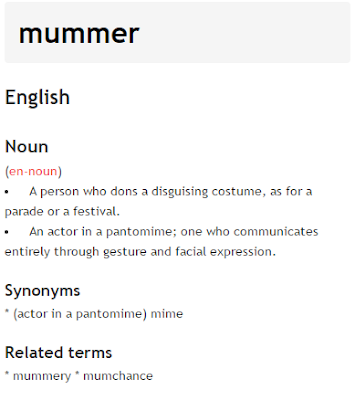 (Ok I am a whiner) I also hum in the shower and sometimes I sing really dorky songs that just come out of nowhere! 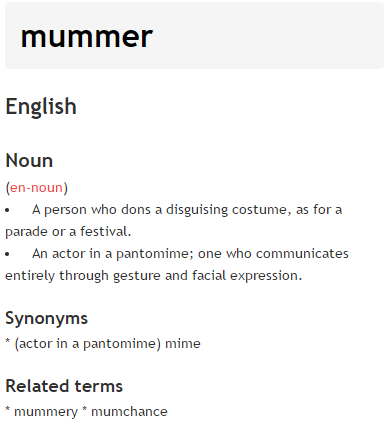 So, I was wondering, do Mummers mumble? 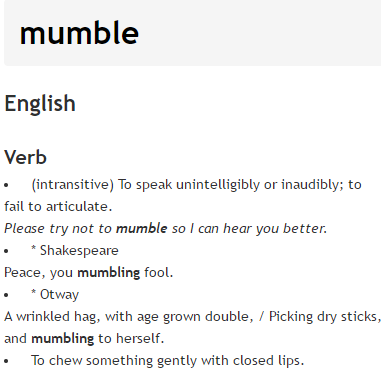 and what exactly are the differences between mumbling and grumbling? See above. I admit, I DO talk to my 2 cats and 1 dog, in the evening when my husband is at work. But that's perfectly normal! I'm a hummer! lol As soon as I start a chore...especially in the kitchen I start humming! Enjoy your day! Start humming! heehee! I talk to the dogs so I don't have to talk to myself. I often sing in public. No one seems to care. Yeah after a certain age, no one cares. Humm muttering...I should of included that as well. 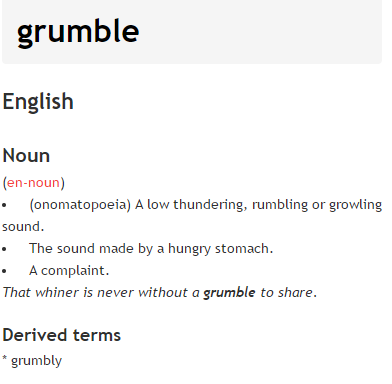 I think I mutter in between grumbling and mumbling. I do a wee talking to myself. I don't mumble much. I'm usually pretty clear about what I don't like and why. I have been trying to pack that outspokenness in. I realize it ages me. It's thought filter we lose as we get older. I'm trying to think young. I used to be outspoken but I am trying to mold myself into a sweet old lady. I'd rather be sweet than a bitter old babe. I don't talk to myself, but sometimes I do talk to my mom who we have lost over fifteen years ago. I am not sure why, but it seems like I feel a little better when it is time for me to make a decision. You "get me". That is exactly what I do.